#41. The Federal Reserve System includes the Board of Governors and the twelve regional Reserve Banks. 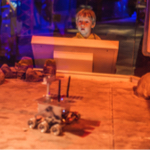 How robots and rovers are taking over Mars. The mission for the Mars rover Opportunity was recently declared finished after the golf cart–sized robot stopped working. A dust storm that lasted for months blocked the sun from getting to the little rover, and it finally quit after 15 years. It was only supposed to last for 92 days. So it lasted 60 times longer than expected! NASA has been sending spacecraft to Mars since 1964! The first few missions were known as the Mariner Project. Most of these missions were fly-bys, meaning the spacecraft got close to Mars but kept going out into space and never landed on the surface. It wasn’t until Mariner 9, in 1971, that NASA successfully orbited the red planet. After that, NASA sent Viking 1, an orbiter and lander team, to Mars in 1975. This was the first successful mission ever to land on the surface of another planet! The Viking missions, both 1 and 2, were stuck in place, only able to move a scoop to the surface of Mars. In 1996, the Mars Pathfinder Mission deployed the Sojourner rover, the first robot to travel on a different planet! That Sojourner rover made it 84 days—77 days longer than expected! It is probably the most famous Mars rover. It’s been in one book, two movies, and was featured on the TV show Star Trek: Enterprise. In 2003 NASA launched Opportunity, a month after it sent its twin, Spirit, to Mars. Both of these rovers were only supposed to last for three months. Spirit lasted 25 times longer than expected. NASA ended the mission after Spirit got stuck in some sand and just couldn’t get out. Currently NASA has the Curiosity rover roaming around Mars. As of right now, there is no planned end for this car-sized robot rolling around the surface of Mars. One of the coolest things about this rover is how NASA landed it safely on the surface—they used a Sky Crane. It was a rocket system that lowered the rover and then flew off and crashed after it did its job! There are a few more rovers coming in the next few years, and one might be a helicopter! As of right now, Mars is the only planet inhabited only by robots. Maybe you will be the one to change that and be the first person to step foot on Mars!